Start the Surveillance is an explorative three-screen installation that is inspired by the ubiquity of surveillance culture, wherein we're both observed and observe. Taking in 4 streams of CCTV footage and using personal information about characters within the piece, the user can trace each character's movements obsessively, fulfilling voyeuristic fantasies. Exposure!! 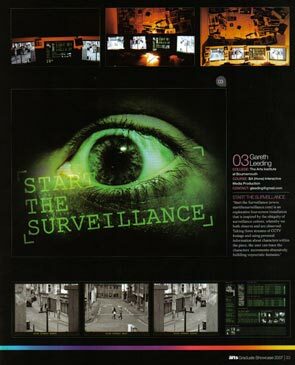 A whole page feature devoted to Start the Surveillance in the Graduate Showcase of the July 2007 issue. Exposure!! 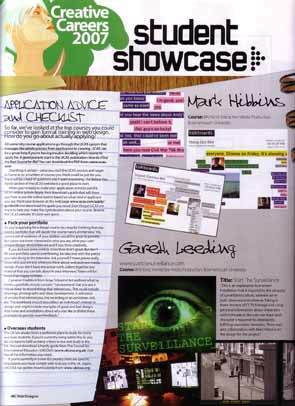 In the Graduate Showcase section in the June release of Web Designer magazine Start the Surveillance has half a page slot. The image below is a holding picture of the front of the magazine until i can gain a respectable scan of the publication. When confronting the installation the user is faced with 3 screens, 2 of which carry 4 CCTV video feeds. 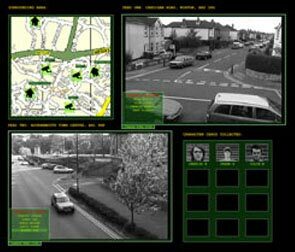 (shown in the screen shot below) Within these CCTV monitors lies the ability the manipulate the size of the video feeds, collect character cards by utilising the tracking facility on the CCTV feeds and to use the drag-map to relate to characters houses and the CCTV feeds. 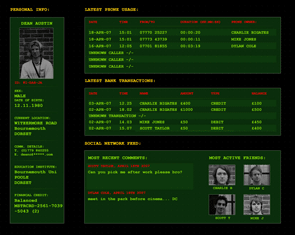 The character cards i mentioned before link to the third screen that is dominated by a constructed database of information based solely around the characters from within the CCTV feeds. An example of a characters information screen is shown below. The key to understanding characters and their movements within the installation is being able to relate the information placed on the installation wall directly to the content on the screens. The image below shows the situation the user finds themself in and how simple it would be to link the information provided on the wall to the screens. It's been confirmed that Start the surveillance will be featured in the iheartplay exhibition. The opening night is Thursday 7th June 2007 and it will continue until Monday 11th June 2007. For an invite and more information see iheartplay, anyone is welcome. I am a 2007 graduate from Bournemouth University who is now working at Blast Radius as a digital creative.